At Uncle Bill’s Pet Center, we not only offer Nylabone dog toys for sale, we also employ a highly trained staff that can assist you in finding the appropriate toy for your dog. The Nylabone Strong Chew Real Wood Stick is a long-lasting chew toy made with real wood plus durable nylon for a safer and cleaner alternative to natural sticks. The patented over-mold technology gives this toy the look and texture of real bark, with NO splintering and NO mess! 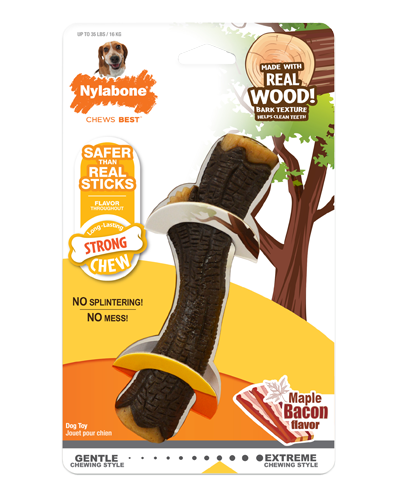 Packed with delicious maple bacon flavor throughout and designed to help clean teeth and freshen breath, this stick chew toy is the safe way for your dog to satisfy his natural urge to chew! We will be glad to work with you to ensure that your pet enjoys quality toys for optimal health and happiness by providing the best selection and value on premium dog toys for sale in Indiana.